My heart, brothers and sisters, is extremely heavy. As many of you already know, I am an ordained elder in full connection in the United Methodist Church. This is the church I was baptized into, the church who prayed for me when I was in critical condition in the hospital at age 3, the church my wife and I were married in, the church I returned to when I came back to my faith in the early 2000s, and the church I finally answered my call in. When I first came back to Christianity, I tried one other denomination prior to settling in the United Methodist Church. When I walked in that fateful Sunday, I was greeted by people as one often is at church on Sundays. When I asked the usher at the door what the difference was between them and a different denomination with a similar name and background, the person responded to ask me what my view on homosexuality was. He then proceeded to tell me that they split from their “heathen” sister church because of their acceptance of gays and how the Bible said gays were all going to hell. Friends, I walked right out of that church and never looked back because I knew that such a judgmental denomination was NOT for me. It is following that experience that I found my way back into the United Methodist Church. At the time I didn’t know the language that is currently in our Book of Discipline. What I did know was that I was welcomed by a loving community that accepted me for who I am and not what I came in believing or not believing. They welcomed, they encouraged me, they loved me and my family, and they supported me in answering my call. That church didn’t just welcome me but welcomed all people. They were a home for the broken, the outsiders, the lost, and the needy. They openly accepted all people, no matter their sexual orientation, no matter socio-economic status, no matter their hurts and/or hangups, no matter what they were or weren’t addicted to. They accepted and LOVED EVERYONE! That witness to Christ’s love is what brought back to the United Methodist Church. I found my place in the UMC while learning of John Wesley and his belief in radical, omnipresent grace, his push for a balance between social holiness and social justice, and his openness to new ideas that were grounded in the Biblical witness of God’s love and grace. I knew, by this point, that we as a church had a position on human sexuality that I disagreed with; however, there was hope that things would change over time. To be clear, I understood and respected the fact that social change takes time because it involves the changing of hearts and not just minds. I still understand and respect that. What happened during the Special Session of General Conference (February 23-26, 2019), deeply saddens me as I know it deeply saddens many United Methodists. The decision to pass the Traditional Plan over and above the One Church Plan, means that the denomination has decided to double down on its unholy ban on LGTBQ marriage and service in the Church. It diminishes their sacred worth, and hangs that up over their sexual orientation. While the United Methodist Church touts having “Open Hearts, Open Minds, Open Doors”, the People of the United Methodist Church have shown the world something completely different. We’ve become a people with closed hearts and closed minds. We’ve become a stick that is breaking because it refuses to bend. We’ve become a people of the closed door. With all of that said, it is important to note that while the global church as a whole voted to adopt the Traditional Plan, it must be said that it only passed by a very, very small margin. There were more than 800 delegates from around the world who voted and if a mere 28 people had voted differently the Traditional Plan would have been defeated. In regard to the inclusive One Church Plan, if 26 people had voted differently it would have passed. These numbers only show that the vote is not reflective of the people called Methodists as a whole, and that gives me room for MUCH hope. My heart is heavy, my sadness deep; however, my HOPE is very much ALIVE. The church has always been in wrestling with Jesus’ call to be ambassadors of God’s inclusive, loving, and grace-filled Kingdom. We often fail at doing so; however, Christ still loves us and lifts us back up out of the mud we sink ourselves into. I have hope that the people called Methodists will find a way to move forward from the tragic steps backwards we just took. Right now, Bishops, church leaders, pastors such as myself, and laity are working toward building a path forward to becoming a people of open hearts, open minds, and open doors once again. In fact, many of us never stopped being that in the first place! We will find a way forward to become a people of one church that accepts diversity in all of its richness, complexity, and sacred possibility. Please join with me in prayer for the people of the United Methodist Church and the people of all denominations as we seek to live out the Gospel commission of making disciples of ALL people (not just some), baptizing them in the name of the Father, the Son and the Holy Spirit. Amen. Inclusivity has always been a struggle in the church, as it has for all of humanity. Here’s the Apostle Paul recalling a confrontation in his fight for Gentile inclusion: “But when Peter came to Antioch, I had to oppose him to his face, for what he did was very wrong. When he first arrived, he ate with the Gentile believers, who were not circumcised. But afterward, when some friends of James came, Peter wouldn’t eat with the Gentiles anymore. He was afraid of criticism from these people who insisted on the necessity of circumcision. As a result, other Jewish believers followed Peter’s hypocrisy, and even Barnabas was led astray by their hypocrisy.” — Apostle Paul of Tarsus (Galatians 2:11-13, NLT). Lord, help us to be a people who do not become closed doors seeking your loving embrace and help us to not become closed doors on people seeking to your call on their lives and serve you. Amen. Part 146: Anna. In the last devotion, Jesus’ parents brought Jesus up into the Temple to be circumcised on the eighth day, according to Jewish custom. Following the ceremony, they ran into an old man named Simeon who blessed the child and prophesied on the significance of his birth. This man had been promised by God that he would see the coming of the Messiah and now, having witnessed the Christ-child, he was content to die. The story does not end there; rather, it continues on in a woman named Anna. Before getting into Anna’s story, there needs to be a basic awareness of the social norms of first century Judaea. Typically, society did the value that women had in society was relegated to childbearing, childrearing and housekeeping. The women were responsible for passing down the faith to her children as a part of her childrearing duties; however, that was the basic extent of women’s value in first century Judaea. Men, on the other hand, had the real voice. Thus, it makes sense that someone like Simeon, in the context of the times, would be the one to prophecy and proclaim the coming of the Christ. It makes sense, within the first century social framework, that visions and proclamations would come from men and not women. In fact, if you look at the Gospel of Matthew you will notice that the visions and actions were done on the part of Joseph, not Mary. Mary has absolutely NO VOICE in that Gospel. But Luke is not Matthew and his Gospel operates counter to the way the other Gospels operate. Sure, Simeon gets his moment in the Temple to see visions and proclaim the Christ child; however, he is merely a common person. He’s no prophet or soothsayer; rather, he is just an old man holding on to the promises of God. Anna, on the other hand, is described by Luke in the following way: “Anna, a prophet, was also there in the Temple. She was the daughter of Phanuel from the tribe of Asher, and she was very old. Her husband died when they had been married only seven years” (Luke 2:36, NLT). Simeon was a common man, and Anna was the prophet. As is always the case, Luke flips the social conventions of his day on their head. While Simeon saw a vision and shared that vision with Mary and Joseph, Anna began praising God and proclaiming to the whole Temple that the Messiah had arrived. While Simeon was blessed with holding the child and praising God before the child’s parents, Anna was tasked by God with proclaiming the Good News to the whole Temple that day. Luke lets us know that Anna was an old woman, who had been widowed for many years. Widows with no sons to care for them often became homeless. This may have been the case for Anna, who is said to have NEVER left the Temple day or night since the death of her husband. But there’s more to it than that. The reference of never leaving the Temple also suggests that Anna was in close and never-ending communion with God! Wow, right? This aged widow, this “nobody” in terms of first century social standards, was in direct communication with God through fasting and prayer. Rather than having been voiceless, Anna is the one who tells everyone the GOOD NEWS! You see, God cannot be imprisoned or contained by our social standards. God transcends them and empowers those we would rather keep in their place. The challenge for us is to reflect on this. We are being to challenged to reflect on the ways in which we try to keep people in their places by placing our social standards like giant cinder blocks around the necks of the voiceless. Remember, God’s ways are not our ways, and God’s wisdom far surpasses our own. Let us be a people who step out of the way and defer such judgment to God. Lord, help me to see past my own biases and the biases of my society in order to see people as you see them. Amen. In the Gospel According to Matthew, Jesus, with his disciples gathered around him, stood up before a crowd of people and began to teach them. “Blessed are the poor in Spirit,” he began, projecting his voice for the multitude to hear, “for theirs is the Kingdom of Heaven.” The crowd was in shock as Jesus uttered these words and, no doubt, the sounds of gasps and whispers could be heard moving from mouths to ears throughout the crowd. It’s not that the crowd was unaware that God takes the side of the poor. Surely, there is Scripture throughout the Old Testament that shows God favoring the poor. In Isaiah 61:1, the prophet writes that the Spirit of the Lord was upon him in order that he might bring the good news of God’s favor to the poor. Also, the wise, sagely, author of Proverbs wrote that God’s justice will fall swift and hard on anyone who tries to take advantage of the poor, for God is their defender (Proverbs 22:22-23). What was most shocking to the crowd was that Jesus proclaimed, with authority, that God was not merely the defender of the poor, which ultimately defends the status quo; rather, God is their liberator. It’s one thing for God to “defend the poor” against people who try to “take advantage” of them, but it is something entirely different for them to be the heirs to the Kingdom of Heaven, as this suggests that God rejects the place the poor have been put in, despite the fact that the world wishes to keep them in that place. This puts the world at odds with God. Some have mistakenly taken Matthew’s use of the phrase “poor in spirit” to be a “spiritualization” of Jesus’ proclamation of blessing upon the literal poor found in Luke. However, phrase “poor in spirit” does not exclude literal poverty from the equation; rather, it shifts the emphasis to what it means to be the people of God. What Jesus is doing is pointing to a quality within the poor that sets them a part from the rich and, in Matthew, Jesus uses the phrase similarly to how it was used in the War Scroll found among the Dead Sea Scrolls. This scroll, written about 80 or so years prior to Jesus’ Sermon on the Mount, utilizes the phrase “poor in spirit” (1 QM 14:7) to denote God’s true people in contrast to the rich and powerful heirarchy of Jerusalem. The poor, therefore, are people who are not in a position to be proud and independent. By virtue of their poverty, they are humble and their spirit has been crushed. They have to daily rely on their faith and hope in God’s promise to bring them justice and liberation from their plight. It is such people who, in their humility, recognize their need for God, while the rich and proud look to their own power, status and capabilities to attain what they believe they need. 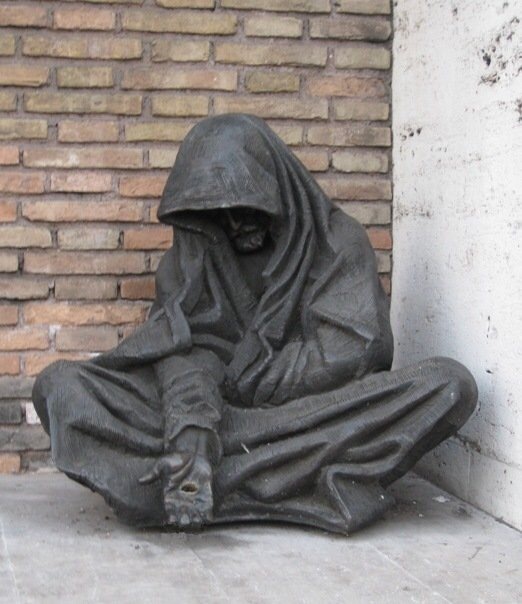 Jesus’ use of the phrase “the poor in spirit” both points us to God’s solidarity with the impoverished and to the kind of spirit they possess as a result of their poverty. If we wish to inherit God’s Kingdom, we need to stand in solidarity with our Lord, who stands in solidarity with the poor. The only way to do so is to let go of our pride, to stop seeing ourselves as being “independent” and above those who are not, and begin to embody a spirit of humility. It is in such humility that we will recognize our need for God, and it is in such humility that we will trust our Lord enough to follow him. While the world scoffs and criticizes the poor, while the world mocks their need for help and assistance, the challenge for us is to embrace the poor, as well as their humble spirit. In doing so we will certainly be embracing our lowly Lord himself. Lord, empty me of my pride and fill me with humility so that I may be counted among the poor in spirit. Amen. Part 11: God’s Favor Realized. It’s truly hard to put the Christian story into perspective. By Christian story, I don’t mean the Gospel story of Jesus of Nazareth, the Messiah, the Son of God. What I mean by “the Christian Story” is the story of the rise of Christianity. In the faith-based film, “Risen”, the filmmakers try to tell account of the Resurrection of the Christ, but they do so from the perspective of the Roman Tribune who led the legionnaires responsible for crucifying Jesus. While, I am not about to give away the film for those who may not have seen it, what is great about it is that it really shows the Gospel message coming into contact with Rome. While the film doesn’t span but 40 days past the Resurrection event, the reality is that, in a relatively short amount of time (only 400 or so years), Christians went from a hunted group of outcasts to being funded by the Roman Empire. How did this happen? How was it possible that a rag-tag group of disciples of a peasant Jewish mystic rabbi would found what ultimately would become the largest of the world religions? How did the one crucified by Roman Empire become the one venerated by that same Empire in less than half of a millennium? Surely, God’s that is evidence of God’s favor realized, right? Wrong. While that historical tidbit is totally awesome and exciting for historians and theologians such as myself, it is more or less evidence of how politics can often take unexpected turns (just look at our current political climate) and that sometimes the most unlikely group can end up benefiting (sort of) from that. But when we look at the Christian Manifesto, we see that God’s favor was not coming to set up a religion, or to create yet another religious “establishment”; rather, God’s favor was falling on those who were poor, captive, blind, and oppressed, as well as to those who choose to bring that favor to them. As Christians, we should witnessing to Christ’s love by standing against oppression and evil in whatever forms they take. Lord, raise me up into a representative of your love, your grace, your justice and your compassionate mercy. I pledge myselfyou’re your manifesto of hope, healing, and wholeness. Amen. Part 8: Oppressed. In our world, it is so very easy to see oppression just about everywhere we turn. We don’t even have to look far or wide. We merely, have to turn on the news to see oppression spill forward into our homes. Stories of people killing others because they are of a different creed, tribe, race, or all of the above. People enslaving women and children and subjegating them to all sorts of horrific and oppressive conditions. Perhaps we know of people who are in abusive relationships who, in the context of such abuse, are subjected to an oppressive living environment. Sadly, some have even found the church to be a place of oppression and subjegation. The truth is that, no matter where we are, if there are people congregated and organized, there is bound to be oppression in one way or the other. Oppression happens when one who is in a position of power lords it over those over whom they are in power. In other words, oppression happens when power is misused and abused. Whether it be in the work enviornment, in a domestic situation, in schools, in churches, in governments, or wherever it is occuring, oppression always involves an abuse of power. You know the phrase, “absolute power corrups absolutely”; too often, good people corrupted by power become monsters and demons. With that said, oppression is pernicious. It does not go away once the oppressor is removed; rather, oppression begets more oppression. Often times, the oppressed end up becoming the oppressor. Having risen out of being oppressed, the victim seeks to put themselves into a place of power so as to never fall victim to the abuse they endured in the past. Other times, the victim acts in an oppressive manner because it is learned behavior and it is all they have ever known, What ever the case, be it self-preservation or ignorance, the oppressed will often morph into the oppressor and the ugly, nasty cycle will continue. Most, if not all, of us have been on both sides of the oppressed/oppressor divide. We’ve all, no doubt, been in situations where we have been abused or where power had been lorded over us in a way that made us feel week, vulnerable, threatened, and trapped. With that said, there are times (even if seemingly minor) that we have been of abusing the power that we have over others. Perhaps in our familial relationships, or in our professional relationships, or in friendships, or in our communities. The point of this is not to point the finger, but to spark a new and more wholesome self-awareness so that we can move forward from where we are to where God is calling us to be. As can be seen in the Christian Manifesto, Christ was anointed by God to set the oppressed free, which means that Christ has both set you free from being oppressed as well as from the oppression of being the oppressor. What’s more, just as Christ has begun the work of freeing the oppressed, so too we Christians are called to carry on the work of eliminating oppression and injustice from our homes, from our communities, from our world and from our midst. The task is set before you as surely as Christ is with you. Amen. “The ultimate tragedy is not the oppression and cruelty by the bad people but the silence over that by the good people.” – Rev. Dr. Martin Luther King, Jr.
Lord, end all oppression and make me a part of the solution and reconciliation process. Amen. For those of us who are Christian, how easy it is for us to call ourselves people of faith, right? We often set ourselves apart from the “non-believing world.” We often separate ourselves from those who “don’t believe” and/or those who “don’t have faith” and see ourselves in an “us versus them” kind of way. I am not pointing this out in order to point out Christians in a way that is different from any other human religion, institution or group. All humans see their group in an “us versus them” kind of way. That is, whether fortunately or unfortunately, the human condition. What I am trying to point out, however, is that Christians do see themselves as being people of faith. I am pretty sure that all Christians, everywhere, would agree with that statement. Yet, in my own observance, many Western Christians (in American especially) do not live out their faith with much conviction. Sure, we are good at being convicted about certain things. I mean, many Christians will flip over backwards to tell you how we’ve fallen from God’s glorious standard (Romans 3:23), how Christ’s death was God’s plan to save us from our sins and close the chasm that lay between us and God, and that all we need to do to be saved is to say the sinner’s prayer (whatever that is) and accept Jesus into our hearts. Once that has been done, we are saved and no longer a slave to sin and death (Romans 8:1-2); what’s more, once we’ve been saved nothing can ever separate us from the love and grace of our Lord Jesus Christ (Romans 8:38-39). We are convicted to tell you that part of the Gospel story, but that is just about where our conviction ends. As a result, Western Christianity is rather shallow and completely skips over the ACTUAL end of the Gospel. Being forgiven of our sins is only a part of the Gospel story…and it happens to be the beginning of it, not the end. You see, anyone who has read any part of the Hebrew Scriptures could figure out we’re sinners and that God is working to forgive us of our sins. It’s not like God wasn’t forgiving sins before Jesus. Yes, Jesus sacrifice for us and the salvation that sacrifice brings is a part of the Gospel story, but not the whole of it; rather, when we accept Jesus and his atoning sacrifice, we also accept the authority Christ has given us. What authority you ask? The authority to represent Christ in the world. We have been the authority to fight against injustice and oppression, the authority to care for and bring healing to the sick, the authority to be present with the lost, the depressed and the lonely. We have been given authority over the powers of darkness and over the inner demons that try to take us and others down. To accept Christ’s forgiveness, to attain salvation in Christ, is to accept the authority that Christ is giving us over such things. But that’s not the end of it either. Once we’ve accepted Christ, and Christ’s authority, we being sent out by Christ into the world proclaiming the arrival of God’s Kingdom. In other words, we are to proclaim to the world that the day of equality, social justice, mercy, compassion, peace, love, and God’s presence has finally arrived. This is exactly what Rev. Dr. Martin Luther King, Jr. was doing when he spoke to the nation at the Lincoln Memorial. It was Mother Teresa was doing in Calcutta, India. It was what Bonhoeffer was doing in Nazi Germany. This is not an activity reserved for a few who are called; rather, ALL CHRISTIANS ARE CALLED to go out into the world and proclaim the Gospel. All Christians have been equipped with spiritual gifts to do such. Of course, this will not make Christians the most popular people in a world that wants to keep the have-nots in their places. Yet, if we are truly convicted in our beliefs, if we are truly a people of faith, then we will bless those who hear and accept the proclamation of God’s Kingdom and shake the dust off of our feet when it comes to those who refuse to. The latter is not intended to be our judgment against them; rather, Christ is telling us to leave the opponents of God to God and is calling us to focus on those who would ally themselves with God and with the arrival of God’s Kingdom of hope, healing and wholeness. The question for us is this, how convicted are we? How much faith do we possess. God knows what tree we are by our fruit. It is much easier to call oneself “a person of faith” than it is to ACTUALLY live a life of faith. Lord, strengthen me and continually work in me so that I may move beyond my fear and accept the authority you have given me. Amen. If I were to walk into any given church, or up to any random person, and ask them what the heart of the Gospel message is, I would more than like receive something like the following: “The Gospel message is that God sent his one and only Son, Jesus Christ, into the world so that he could be the perfect sacrifice for our sins. Because Jesus was perfect and without sin, he became the spotless lamb led to the slaughter in order that he may die the death we deserve in order that those who believe in him might be atoned to God and saved.” This is the, in essence, the modern, popular Christian understanding of the heart of the Christian Gospel. Jesus came to die so that we might live. Yet, when you read the Gospels themselves, we find that Jesus dying as a sacrifice for our sins is just a part of the Gospel story. It is not the whole of it. Yes, Jesus’ death and resurrection are vitally important to Christian theology, Christology, and the Gospel message; however, only so when it is told in the context of the other components that we find in the Gospel. When those components are missing, what we end up is with a skewed, inaccurate portrait of the purpose of Jesus of Nazareth, as well as a skewed and inaccurate portrait of God’s purpose for sending Jesus, the Christ. While it is certainly true that Jesus’ death and resurrection has brought about salvific and transformative atonement from our sins, to only tell that part of the story does an injustice to the life and the teachings of the Christ. In fact, it not only does a disservice, but it completely ignores Jesus’ life and teachings altogether, as if they are simply secondary and/or non-important. Yet, was Jesus’ life and teachings trivial? Was his life and teachings secondary, just a necessary back-story to his ultimate death and resurrection? If that is the case, if Jesus’ teachings are trivial and secondary to the work of salvation in the world, then why go down the route of teaching and preaching at all. The Gospel writers could have simply just had Jesus proclaim that his the messiah and the son of God, have people reject that, have him crucified, died, buried, resurrected and be done with it. But that is not what the Gospel writers did. Rather, they included the whole of Jesus’ life and they dedicated most of their time on Jesus’ teachings. For them, the person of Jesus of Nazareth and his teachings were both as integral to God’s salvation plan as his death and resurrection were. Jesus came, not to die, but to bring TRUE LIFE into the world. To show them what God means by LOVING GOD and NEIGHBOR. Jesus came to set the example and to personally deliver the beginnings of God’s reign in the world. But, like Jesus’ own parable of the wicked tenants suggests, some of those in the world to whom the father sent the son (e.g. the Romans, the politicians, some of the religious leaders, etc. ), rejected his identity, as well as his authority, and tried to eliminate him. That plot, though, ultimately failed; rather, what happened was that God made the greatest good EVER come out of both the life and the death of Jesus. Instead of remaining dead, Jesus resurrected and now sits in power and authority in a complete union with God. Those who believe in him have found the power of redemption, as well as the transformative presence of the Holy Spirit and the perfecting grace of God in their lives. They are not saved, but are transformed and are living out their FAITH in real and tangible ways. The challenge for us is this, don’t be misled by a lopsided and misguided Gospel. Jesus wasn’t born merely to die. What kind of God would scheme up that kind of plan? Rather, Jesus was born so the he might LIVE in the world and that through him we might attain TRUE LIFE. Even in the face of evil, and even when finding himself in the valley of the shadow of death, Jesus perservered and triumphed over death because in him was a presence greater than death…the very presence of GOD. Through our belief in Christ, through our following his example as detailed in the Gospel, and through his death and resurrection, we have found REDEMPTION and have been placed on the narrow path that leads to life. Let’s start walking it. Lord, I open my heart to the truth of your Gospel. Perfect me in it and set me a part a witness to its power. Amen. Two weeks ago, America was tuned into the 24 hour news cycle. It wasn’t because of some nefarious criminal, or some horrendous crime. It wasn’t because some celebrity was getting married or that some other celebrity was getting divorced. There were no major scandals, and for the first time in I am not sure how long, the news wasn’t very negative at all. Why was this? Because Pope Francis I was visiting the United States of America for the very first time. He started off in Washington D.C., headed from there to New York City, and finally ended up in Philadelphia. The news, and the country, could not get enough of it! With that said, not ALL of the news was positive. All of the commentators seemed happy that the Pope was here and they were praising him and his papacy; however, with that said, some commentators objected to some of Pope Francis’s stances. Some disagreed with his stance on climate change, while others disagreed with his stance on capital punishment. Some were astounded that the Pope would come to the U.S.A and talk about the injustice found within the golden calf we call capitalism. Some were upset he interjected in our ongoing immigration debate. 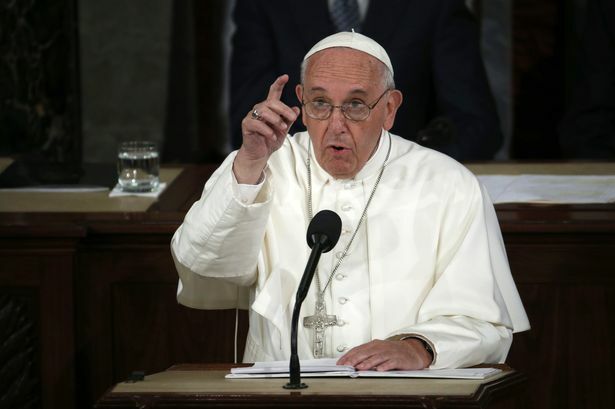 “With all due respect to the Holy Father,” I heard one commentator state, “he really should stick with things of a religious nature and leave the politics to the politicians. He’s the head of the church, and while at the Vatican he is also the head of state, America is not a theocracy and he is out of his league speaking in politics here.” Some commentators opined that the Pope didn’t understand capitalism in American and that he only knew capitalism to be as it was in his country of Argentina: crony capitalism (as if that doesn’t exist here too). Hearing all of the debates going back and forth made me question, was the Pope out of line for speaking out politically against things he felt were wrong, unjust and in need of change? Should a religious and/or spiritual leader simply keep to “religious” things and leave politics to the politicians? Of course the answer is both yes…and NO! Let me address “yes” first. If a religious leader is putting themselves out into the political sphere to garner political points or to receive political gain, then obviously that religious leader is acting inappropriately. If the religious leader is pushing an inherently political agenda for the purpose of getting a specific person elected, or to push his/her congregation to endorse a specific candidate, I will concede that the religious leader is in the wrong. Yet, I object the claim that religious leaders should stick to religion and leave the politics to the politicians, because that inherently disregards what religion is and it denies the very station that religious leaders and prophets (Jesus included) have taken in society. You cannot divorce religion from politics, just because a religious leader’s message is inconvenient to one’s agenda. The fact is, if a society is acting unjustly, then it is the religious leaders duty to speak out against that injustice. That isn’t political…IT’S RELIGIOUS. Religion literally means to reconnect or rejoin together. It is the reconnecting of our relationship with God and with our neighbors. It’s all about relationships. Therefore, if a society is in moral decline and/or if there is injustice and oppression within it, then it is counteracting the call of the Spirit to be in right relationship with God and neighbor. It is also hindering others from doing the same. It is a religious person’s duty, it is their obligation to speak out on those subjects no matter how inconvenient those truths might be. That can be done without naming people, without any hidden agenda and certainly without bashing or endorsing candidates; however, the faithful are called to stand up against oppression and injustice. As I see it, Pope Francis is leading the way. Don’t scoff, but join him in ending injustice. Lord, let justice roll down like waters, and righteousness like an ever-flowing stream. Strengthen me to speak your words of truth to the power. Amen.